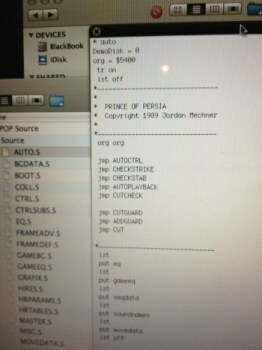 The source code to the original Prince of Persia has been saved. Prince of Persia creator Jordan Mechner made a remarkable discovery back in March: floppy discs containing the original Prince of Persia Apple II source code. The discs were in a box, alongside unopened Spanish Drosoft copies of Prince of Persia and Karateka, sent to him by his father, who discovered it during a bout of spring cleaning and sent it off to Junior. Mechner said at the time that he wanted to get the data off the floppies and onto a more modern format, but was naturally concerned about data corruption. 22-plus years is a long time for such a notoriously delicate medium, after all. But with the help of digital archivist Jason Scott, Apple II collector Tony Diaz and "dozens of others who contributed their expertise via IRC, skype and twitter," he, and we, got lucky, and the data was saved. The experience prompted Mechner to offer some advice about storing information on digital media and the long-term importance of hard copies. "Try popping your old 1980s VHS and Hi-8 home movies into a player (if you can find one). Odds are at least some of them will be visibly degraded or downright unplayable," he wrote on his blog. "Whereas my parents' Super 8 home movies from the 1960s, and my grandparents' photos from the 1930s, are still completely usable and will probably remain so fifty years from now." "Pretty much anything on paper or film, if you pop it in a cardboard box and forget about for a few decades, the people of the future will still be able to figure out what it is, or was. Not so with digital media. Operating systems and data formats change every few years, along with the size and shape of the thingy and the thing you need to plug it into," he continued. "Skip a few updates in a row, and you're quickly in the territory where special equipment and expertise are needed to recover your data. Add to that the fact that magnetic media degrade with time, a single hard knock or scratch can render a hard drive or floppy disk unreadable, and suddenly the analog media of the past start to look remarkably durable." But why go to all this trouble to save some old, effectively useless data in the first place? "Because if we didn't, it might have disappeared forever," he wrote. Fans of 6502 assembly language and those with a taste for videogame history can get a look at the Prince of Persia Apple II source code and a readme file containing a bit more background information at GitHub.